When date night rolls around, it can be tricky to think of something creative and unique to do. Sometimes you just want to do something that you know you love but how do you make it something special!? Well, we have a very fun date idea that will make choosing what to do for date night into a game. 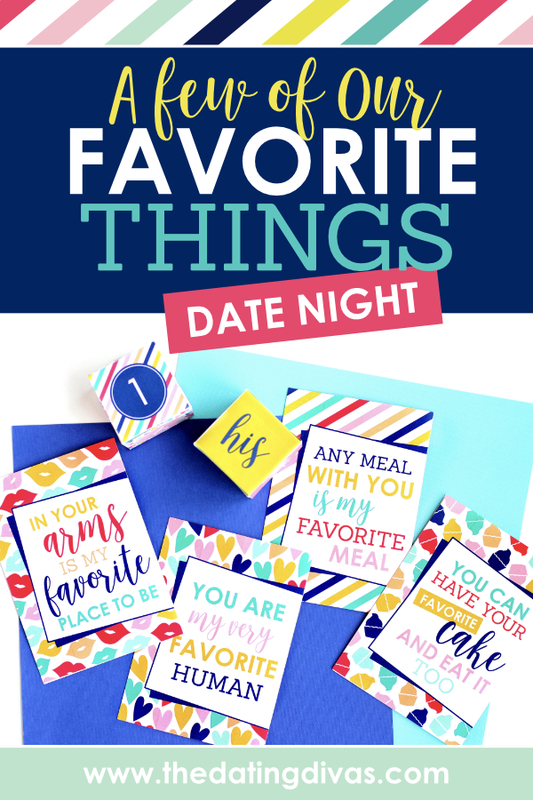 With our favorite things date night, you’ll be sure to do a FEW of your favorite things, but it’ll still be a surprise! Check out the details for this easy date night below and get ready for date night! Date night doesn’t have to be extravagant or a new, creative idea… although, you know we love our creative date nights! Try doing a few of your favorite things – with a twist! 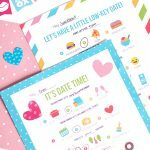 These adorable printables (designed by Messes to Memories) will turn something ordinary that you love into a fun and extraordinary date night! First, send your spouse our cute, little digital invite! We love texting something sweet to let our spouse’s know we have something special up our sleeve for date night! There are 4 fun double-sided cards. 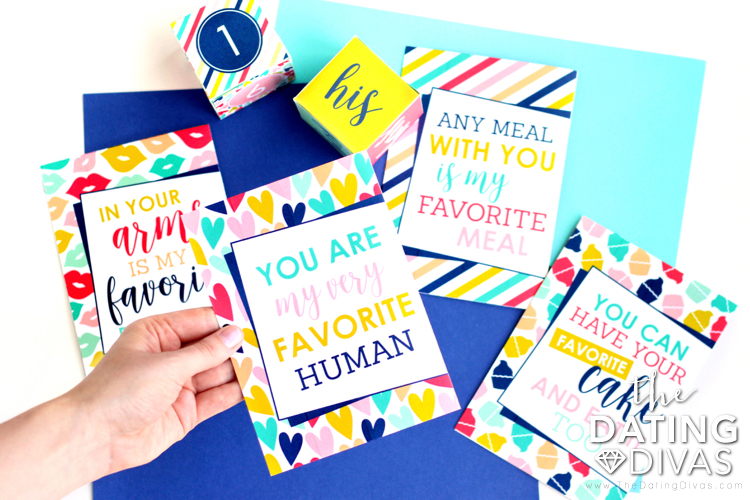 On one side there’s a cute favorite things quote and on the other side a place for you and your sweetheart to write your favorite dinner, dessert, activity and bedroom fun on the back. 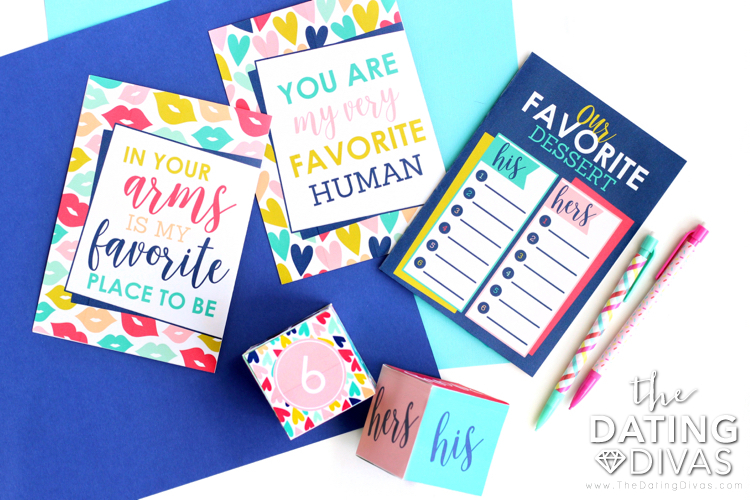 Take turns with your spouse and write your 6 favorite things on the back of each card. Now its time to let the games begin! 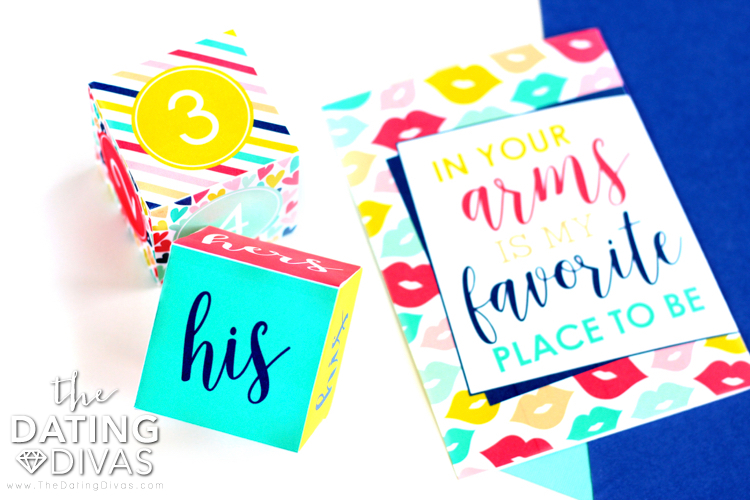 Choose a card and roll the dice to see if you are going to do one of HIS or HER favorite things. 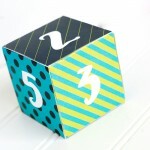 The other dice will tell you what number you’ll be doing. 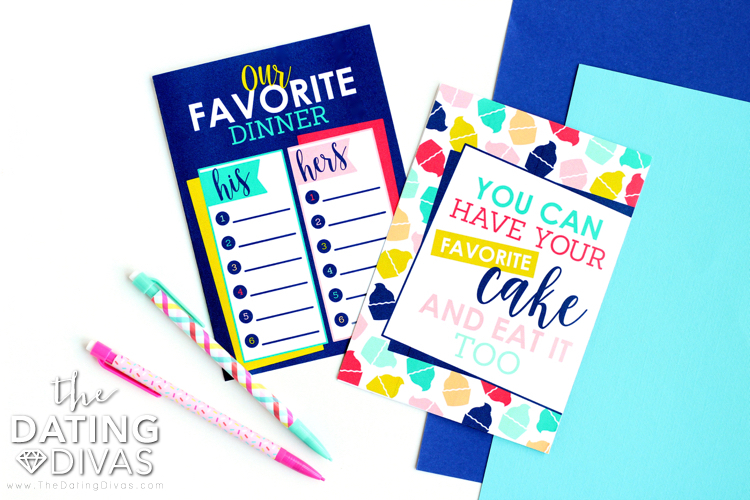 Complete your favorite things activity, pick a new card and repeat! 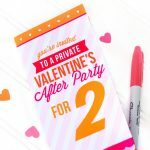 How easy is this date idea? You are guaranteed a night that you’ll enjoy since its all of your favorite things, but it’s still something fun and unique and a total surprise because you never know for sure what the dice will land on! 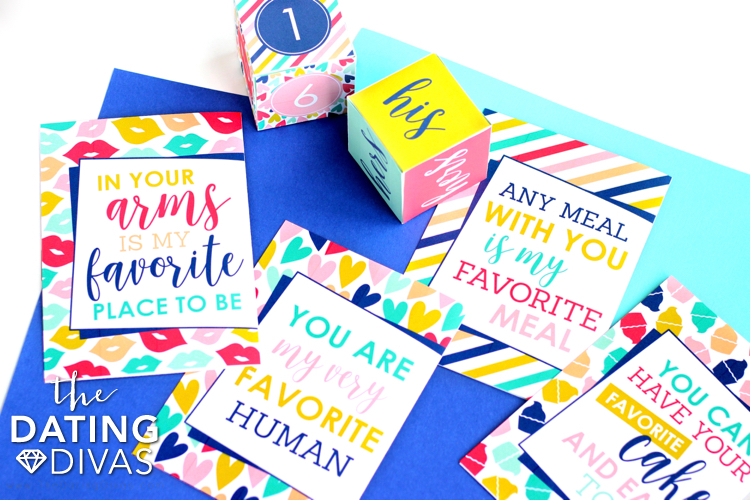 The quote on the front of the activities card is “You are my very favorite human!” Which is a pretty fitting quote for a date night you get to spend with your sweetheart. Some of our favorite activities include board games, tennis, and disc golf. “Any meal with you is my favorite meal!” is the dinnertime quote. Now you can write down dinner ideas that you like to make together, eat together or even a restaurant you love to frequent. It’s completely up to you! What are your favorites? 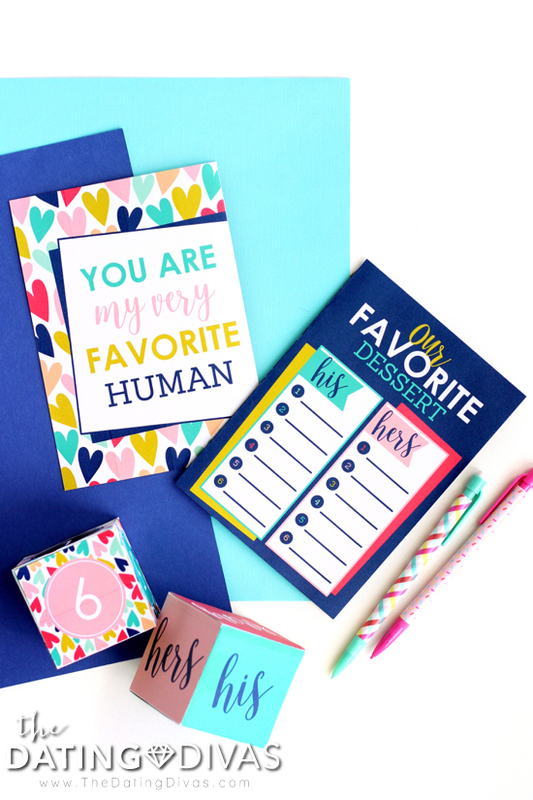 The neat thing about this date idea is that it can be used again and again, since every time you fill out the cards you can write down what your current favorites are. Your mood determines your choices! Say you’re in a chill mood, your favorite dinner might be pizza delivered to your door! Feelin’ fancy? Hit up your favorite fancy restaurant or make a fancy candlelit dinner at home. After dinner, comes dessert! It turns out “You can have your favorite cake and eat it, too!” At least you can on your favorite things date night. Roll the dice and find out what you’ll be having for dessert! You can try to have a few of your favorites on hand if you want it to be easy. Or if you’re already out for dinner, maybe you’ll want to choose another favorite place to go out for dessert. Date night is not over yet! Time for your favorite bedroom fun… you know what to do! Write down your favorite activities and then roll the dice. We have plenty of fun bedroom activities you can add to your list. If you haven’t tried our Love is Sweet game, you definitely should. It’s a Diva favorite! Love the favorite things theme? We do too! Check out this Favorite Things Questionnaire and get to know your spouse's favorite everything. That way you can surprise them with a few of their favorite things! Oh, and you have to host one of these Favorite Things Gift Exchanges with your girlfriends! This is definitely one of OUR favorite things! Ok this is the cutest!! Favorites night coming right up! I LOVE this date night! Just printed it!! LOVE that there’s a digital invite!! How fun! Thank you! Hope they love it as much as we did! SUCH a fun idea for a date night!!!!! Love this one! This one is DARLING!! Can’t wait to try it! So easy! And everyone has fun! This is such a great and easy idea for a date night in! Love it!! You’re welcome! It’s a fun date!